St Gemma Galgani: From the closing paragraph of "The Voices of Gemma Galgani"
From the closing paragraph of "The Voices of Gemma Galgani"
"Daughter of mine, the truth you need to know, you already know; as for the monsignor, it is not yet time for him to know, but the time will come when he will know. As­sure him that it is I, Jesus, who speaks with you and that in a few years by my doing you will be a saint. You will perform miracles and you will receive the highest honors of the altar." This presentiment did not sit well with Father Germano, who excised the passage from his printed version of Gem­ma's letters. Upon learning so explicitly from her celestial bridegroom that such a wondrous future awaited her, she may have been far less shocked or chagrined than her confessor proved to be. For less than three months earlier, on December 22, 1900, the Saturday before Christmas, as she slept peacefully, Gemma had been consoled by a dream in which "...almost fifty boys and girls--like little angels, it seemed to me, surrounded my bed in prayer, all with lighted candles in their hands." Influenced no doubt by prior warnings from Father Germano, to whom she wrote of this event, she expressed her fears that the dream might be a diabolic trick meant to feed upon her sinful tendency toward vainglory. Then again, maybe Gemma Galgani knew all along that one day she would become "Saint Gemma"? 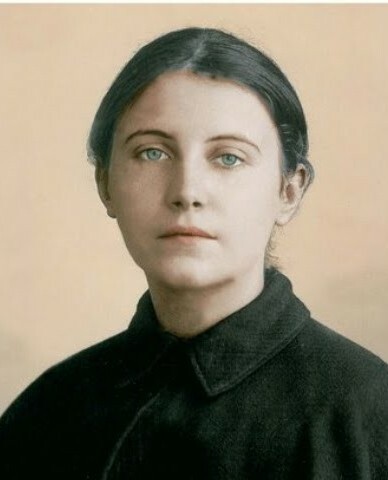 Im truly moved in spirit, hearing the life of Saint Gemma Galgani. I set out to research for a Saint for my daughter's studies, I came away with Saint Gemma, from now will be known by my children.